1: ALUMINET reduces heat load in the greenhouse. Because of the highly reflective nature of ALUMINET®, radiation is reflected away from the net. With black shade cloth, the radiation is absorbed by the net resulting in hotter nets. The black net thus provides a heat source to the greenhouse at a time when the greenhouse should be cooled. If ventilation is adequate, temperatures in houses with black net can be maintained very near houses with ALUMINET, but the fans will be working more to achieve the result. In situations where the heat load is pushing the ventilation to its limits, actual temperature differences will occur, with the ALUMINET being cooler. 2. ALUMINET works as a thermal blanket. All warm objects become cooler by giving off long wave, infrared (heat) radiation. At night, the warm earth surface cools as it gives off infrared radiation. On clear nights, this radiation is lost into space. On cloudy nights, some of this radiation is reflected back to the earth by the clouds, maintaining a warmer temperature than would occur on a clear night (under otherwise similar conditions). Within the greenhouse, this same process is going on. The plants and floor give off invisible heat radiation at night. ALUMINET, when installed as a thermal blanket/shade cloth, reflects this radiation back to the plants maintaining warmer leaf temperatures. This decreases condensation on the leaves as well as helps to maintain warmer air temperature within the canopy. Because the net is open weave, air does pass through the net. While this tempers the thermal benefits to some degree (compared to a solid screen), this has distinct advantages, particularly with naturally ventilated houses. First, the open weave of ALUMINET allows better movement of hot air to roof vents when used as shade during the day, and second, it allows moisture to pass through to the peak of the house, maintaining lower humidity near the plants. In this shade house, Aluminet provides frost protection while less reflective nets in the background fail. Aluminet is effective in reflecting long wave (heat) radiation back to the plants at night. Higher yield, especially in tall canopy crops. 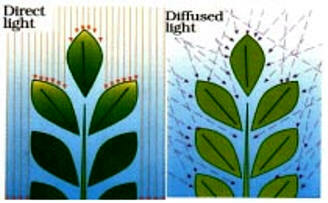 With direct light, the upper leaves get excess light and the lower leaves are in shade. With diffused light, the light is spread more evenly throughout the canopy. In a greenhouse tomato study in Israel, a 6-7% increase in tomato yield (11,574 kg vs. 10,866 kg for one manufacturer and 9972 kg vs. 9094 kg for a second manufacturer) was seen for films with diffusive agents (comparisons include the same films with and without the diffusive additives). More diffused light will minimize shadows within the greenhouse, giving more constant light throughout the greenhouse. Diffuse light gives more light into the lower canopy, which may stimulate branching. Notice the blue and bronze coloring in the strands of Aluminet. The blue is reflected from the sky above while the bronze is reflected from the fabric beneath it. Because the strands are twisted, ALUMINET will reflect diffused light from many directions.